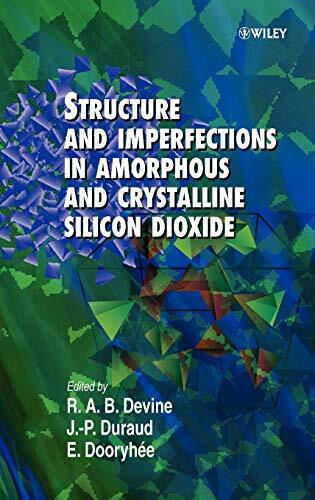 Structure And Imperfections In Amorphous And Crystalline Silicon Dioxide: 9780471975366 Hardcover - LIMEROCK BOOKS INC. Structure and Imperfections in Amorphous and Crystalline Silicon Dioxide Edited by R. A. B. Devine, University of New Mexico, USA J.-P. Duraud, ESRF, Grenoble, France and E. Dooryhée, ESRF, Grenoble, France Silicon dioxide is one of the most common naturally occurring materials. Its applications range from nuclear waste storage to optical fibre communications to silicon microelectronics. Experts from America, Europe and Japan have written chapters covering both the amorphous and the crystalline phases of the material with particular reference to its structure and defects. The book is divided into four sections: Topological Models for the Crystalline and Amorphous Phases Electronic Structure Macroscopic and Point Defects Processing and Applications of Crystalline and Amorphous Phases Engineers, researchers and postgraduate students of materials science, physics and engineering will all find this an extremely useful addition to their libraries.